Argon’s 1 Mil polyimide discs are ideal for use to protect areas on circuit boards during wave soldering or electronic production. These polyimide discs are high heat (500F)and puncture resistant. Discs are on a clear split back liner. 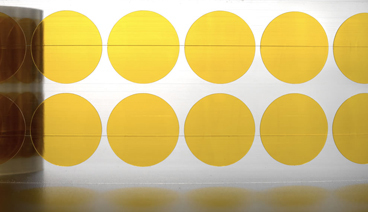 Kapton® Discs are made from Dupont Kapton® Film. These discs are 1 mil thick with 1.8 mil of silicone adhesive. These discs have high dielectric strength and are ideal for use to protect areas on circuit boards. Discs are on a clear split back liner.